Here is a nutrition statistic that is quite alarming: The average American consumes less than 16 grams of whole grains a day, falling far short of the 48 grams per day target for people over the age of nine. (Younger children need 32 grams of whole grains per day.) Fewer than 5% of adults consume the recommended amount and less than 30% of adolescents consume more than 8g of whole grains a day. Why is that? Taste, time and skill required to prepare whole grains foods are cited most often as the reasons. Could another problem be confusion between whole grains and dietary fiber, a term with which consumers may be more familiar? It is important that they understand the difference: Whole grains are represented by the entire kernel of grain, whereas fiber is a component found within the grain. When whole grains are lacking in the diet, individuals miss out on beneficial nutrients such as B vitamins, protein, iron, and vitamin E, which positively contribute to our health and wellbeing. Research also suggests that consumption of whole grain products, along with a balanced diet that is low in saturated fat, is associated with protective health benefits against diseases such as type 2 diabetes, cardiovascular disease, and a reduced risk of weight gain. You can help your shoppers improve this dietary deficiency by showing them which food products contain whole grains. At the recent Shopping for Health conference in Austin, Texas, Nabisco made available this shopping list to better equip consumers to make healthful choices when it comes to snacks. Nabisco products like Triscuits and Wheat Thins are a good way to add whole grains to your day, in a tasty and convenient way. 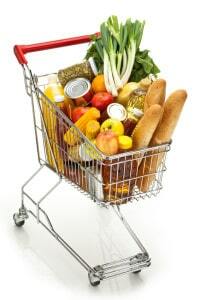 Use this shopping list to be sure to cover all the food groups and choose from a variety of whole grain options. Grapes of all colors – red, green and black – are a natural source of beneficial components called polyphenols, which can also act as antioxidants. Grapes are a heart-healthy food that can play a role in healthy aging, and research suggests positive links between consumption of grapes and eye health, brain health, bone and joint health, cell health and more – all in addition to grapes’ well-established support of heart health. “Grape” News for High Blood Pressure. In a recent series of laboratory studies, rats were fed a salty diet, and their blood pressures rose as a result. When grapes were added to their diet, blood pressure levels dropped, heart function improved and inflammation was reduced throughout their bodies. These animals also showed fewer signs of heart damage compared to those who did not receive grapes in the diet. A Boost for Colon Health. In a small human study of colon cancer patients, those adding 2 ½ cups of grapes a day to their diet for two weeks were able to inhibit certain genes that promote tumor growth in the colon. This benefit was observed in the healthy tissue of the subjects’ colons, not the cancerous, indicating a potential role for grapes in helping to maintain a healthy colon. All Eyes Are On Grapes. Regular grape consumption may play a role in eye health by protecting the retina from deterioration. One study showed that adding grapes to the diet early in life prevented blindness in animals that were prone to developing retinal damage in old age, similar to age-related macular degeneration in humans. When compared to lutein, grapes offered significantly more protection. And in a second study, a grape-enriched diet offered protection in multiple ways, from countering oxidative stress to lowering levels of inflammatory proteins and increasing protective proteins in the retina. A carton of eggs may look simple in the refrigerated case in your store, but to shoppers, it can be confusing to try to read the information posted there, and to understand completely what they are buying. 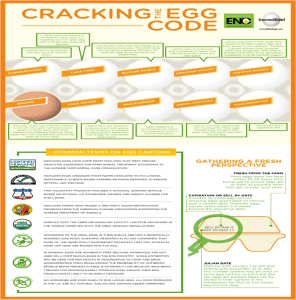 This fact sheet from the American Egg Board will help. Definition and differentiation of kinds of eggs sold in most stores. Access a PDF version of this chart at www.shoppingforhealth.org for distribution to consumers. Want a tasty high-protein snack that is easy to make and keep on hand? 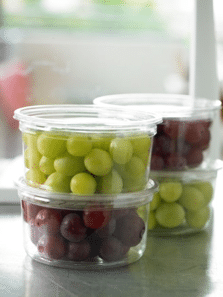 Something kids can grab from the fridge to put in a lunchbox or eat on the way to basketball practice? Try hard-boiled eggs! More than six grams of protein is packed into each 80-calorie egg, along with just five grams of fat. 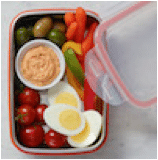 Plus, they are one of the few foods that contain vitamin D.
From the American Egg Board, here are some quick tips to dress up a simple hard-boiled egg, to offer snacks in a variety of flavors, along with that all-important protein for muscle build-up and satiety between meals. Make a dozen hard-boiled eggs each Sunday to ensure that you have plenty on hand throughout the week. For a sweet treat, try egg in honey. Place eggs in a saucepan large enough to hold them in a single layer. Add cold water to cover eggs by 1 inch. Heat over high heat just until boiling. Drain immediately to serve warm, or cool completely under cold running water or in a bowl of ice. Refrigerate if not serving right away. Supermarket Dietitians: As you plan for the year ahead, make certain that Shopping for Health is part of your resource bag. Is your contact information with Shopping for Health up to date? Shopping for Health is your best one-stop-shop for nutrition news and information, recipes, in-store communication pieces, and ideas to educate your shoppers about the food products in your store. Materials presented through Shopping for Health are always reviewed and edited by our team of RDs, to be certain that you receive the reliable information that you want, in a format that you can use. Shopping for Health has much to look forward to in 2016 and we want you to be a part of it all! We’re also excited about the sixth annual Shopping for Health conference for retail and supermarket dietitians, to take place in Austin, Texas, April 3 – 5. This unique meeting designed to meet the specific needs of retail RDNs has been called “the best in the industry,” based on the outstanding program and networking opportunities it provides. Invitations will go out later this month, so let us know if you’re interested in attending. And finally, keep tabs weekly on news from Shopping for Health and our sponsors by Liking our page on Facebook, following us on Twitter and connecting with us on LinkedIn. We use social media to bring our sponsor’s news to you and your shoppers. 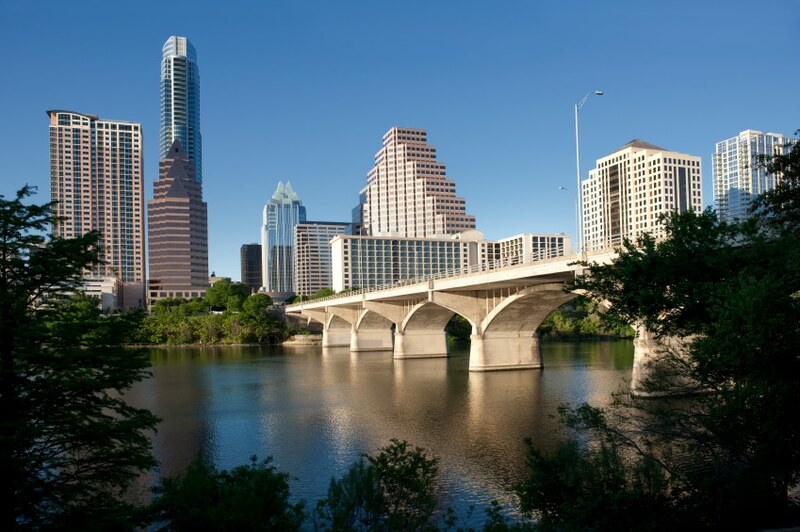 Shopping for Health 2016 will take place April 3 – 5 in the fabulous city of Austin, Texas. The sixth annual SFH conference will provide supermarket RD guests information they need to help shoppers make wise choices at the grocery store. A wide range of program speakers and activities, combined with networking specifically tailored to the interests of retail dietitians, makes Shopping for Health the best known and most highly rated conference for retail dietitians each year. 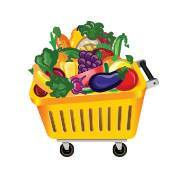 Shopping for Health is made possible by the support of food industry sponsors. Invitations will be distributed in January 2016. Continuing Education Credits from the Academy of Nutrition and Dietetics will be available. For more information about Shopping for Health 2016, contact nancy@shoppingforhealth.org. 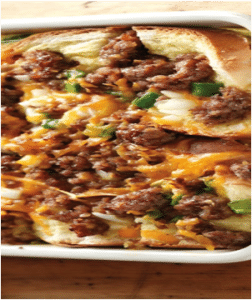 This week’s Shopping for Health blog post is brought to you by brands in the family of Tyson Food products – Jimmy Dean and Hillshire Farms. Both had products on the menu at the 2015 Shopping for Health conference, showing off new and tasty ways to use these long-time favorites. If your shoppers are looking for recipes that make breakfast or brunch easy for holiday houseguests, here are two to try. Preheat oven to 325°F. Toss apples with sugar and cinnamon; set aside. Beat eggs, milk and vanilla in large bowl with wire whisk until well blended. Add bread cubes, sausage, apple mixture and 1-½ cups cheese; stir gently until evenly coated. Bake 40-45 minutes or until knife inserted in center comes out clean. Let stand 10 minutes before cutting into 12 squares to serve. Serve with warm maple syrup. Cut sausage into small cubes. Heat large non-stick skillet over medium-high heat for 3 minutes. Add sausage, onion, garlic and black pepper; cook, stirring frequently 4-5 minutes or until onion is tender. Stir in beans and hot sauce. Reduce heat to low, cover and cook 5 minutes. Warm tortillas according to package directions. 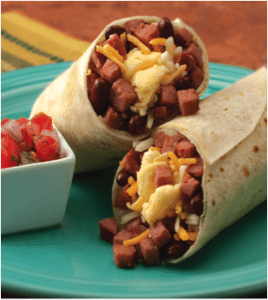 Place a generous ½ cup of sausage mixture on tortilla, top with ¼ cup cooked egg and ¼ cup of cheese. Roll up tortilla and repeat with remaining ingredients. Your shoppers are probably familiar with the MyPlate design of how to best construct a dinner plate. Here’s how to make it even easier for them – show them how to MyPlate a Shopping Cart, as they stroll through your aisles. Daisy Cottage Cheese has a new MyPlate for the Cart handout to help you show consumers how to make the best selections in the store, for healthier eating. Translate the plate to the cart. Picture imaginary lines in the cart dividing it between grains and vegetables (largest shares), followed by protein, fruits and dairy. Linger in the produce aisle, making half of the cart fruits and vegetables. And in addition to fresh fruits, look for fruits that are frozen, canned (in water or 100% juice) or dried. Eat these throughout the day: at breakfast, top cottage cheese with bananas or strawberries. Choose fruits as snacks, salads, and desserts. Fill the vegetable section of your cart with a variety of colorful vegetables – red, orange, and dark-green veggies like tomatoes, sweet potatoes, and broccoli. Fresh, frozen, and canned vegetables all count. Make at least half your grains whole. When shopping, check the ingredients list on product labels for the words “whole” or “whole grain” before the grain ingredient name. Substitute whole grain choices, like whole-wheat bread and brown rice, for refined-grain breads, bagels, rolls, breakfast cereals, crackers, rice, and pasta as much as possible. Vary your protein food choices. Choose a variety of foods from the protein food group, such as seafood, beans and peas, and nuts as well as lean meats, poultry and eggs. Select meats and ground beef that are at least 90% lean. When it comes to dairy, choose skim or low-fat products. Skim and low-fat dairy have the same amount of calcium and other essential nutrients as whole fat, but less fat and calories. Fill the dairy section of your cart with products like milk, cheese, cottage cheese and yogurt. Over 200,000 comments were submitted to the FDA on these proposed changes. The FDA is in the process of reading these comments and will give their replies in the final ruling expected to be released spring of 2016. In July 2015 the FDA released a proposed rule for the addition of added sugars with a Daily Reference Value (DRV) to the nutrition facts panel. It has been proposed to change the current word for sugars on the NFP to “Total Sugars” with an indented “Added Sugars” beneath. The FDA proposes an adult daily value for added sugars to be 50 grams. Added sugars on the new NFP would be expressed as a percent of this 50 gram daily value (DV). The new Dietary Guidelines are reported to recommend added sugars should not be more than 10% of an adult’s total calorie intake. Based on of a 2,000 calorie diet, this would equate to 200 calories from added sugar per day. A gram of sugar has 4 calories each, thus the 50 gram recommendation. December 1, 2015. There has been much confusion over what needs to be calorie labeled in the retail setting. Many retailers provided questions to the Food Marketing Institute (FMI) in search of answers. On behalf of the retail grocery industry, FMI submitted these questions to the FDA. Between the submission of these questions and the lack of clarity on retail labeling, the FDA has granted a one-year extension to retailers to allow more time and better understanding of the new regulations. The FDA states they will come out with a clarification on the regulations soon, but nothing has been released as of this writing. Proposed Label/What’s Different. Food and Drug Administration website. We talked a lot about walnuts at Shopping for Health this year and with good reason: With more than 150 health studies on head-to-toe health conducted around the glove, the evidence supports walnuts as a leading nut for nutrition. Daily consumption of about 2.5 ounces of walnuts helps to improve sperm motility, morphology and vitality. To assist the brain and cognition, walnut consumption helps preserve or improves cognitive reasoning, balance/ coordination, learning ability and inferential reasoning. In cancer prevention, walnut consumption is associated with reduction in size of tumors (breast cancer, prostate cancer) and tumor growth reduction in prostate cancer (speed of growth and size of growth). Add walnuts to any stir-fry dish. 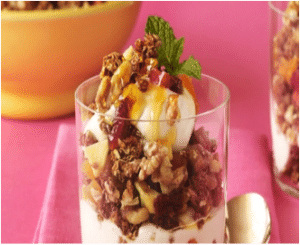 In a large bowl, stir together oatmeal, bran, walnuts and sesame seeds. In small microwaveable bowl, combine honey, and vanilla; microwave on high for about 20 seconds or until runny. Stir to mix; pour over dry ingredients and toss to coat well. Spread evenly in large, shallow baking pan and bake at 300°F for about 30 minutes, or until golden, stirring two or three times. Cool completely. It will crisp as it cools. Stir in raisins and store in airtight container. Serve for breakfast with Greek yogurt or cottage cheese, or as a dessert sprinkled over ice cream.